I know I haven’t really said a lot about astrology in the past few months, my attention has really been with other things. I have been privately observing the new and full moon cycles and wanted to say a little bit about the new moon coming up. 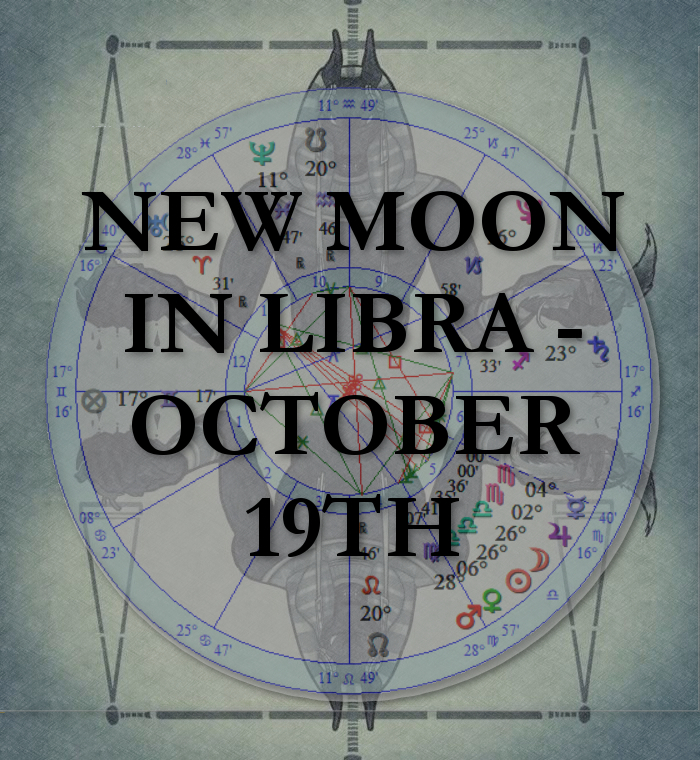 The new moon is in the cardinal sign of Libra, the sign of balance. This brings in the energies of balancing the mind and body. The past few days may have been a bit ‘heady’ with you stuck in a spiral of doubt, negativity,criticism or just being extremely (over)thinky! This is up for transition now, with Libra wanting to bring balance, justice and order to the mix up. What else is influencing us right now? The Sun is in Libra for another few days, the influence of Scorpio is beginning to come in, Mercury has already moved into Scorpio, meaning communications may be a little sharper this week! Mars is in Virgo, so bringing in a work ethic whilst Venus is in one of its homes signs- Libra at the moment. Whilst often seen a loving harmonic sign, Libra is also very much the Anubis of the zodiac and he weighs up the situation. Saturn is doing the rounds in Sagittarius, Neptune is retrograde in Pisces, Jupiter transitioned into Scorpio last week and Uranus is still in Aries. Pluto is still in Capricorn, Chiron in Pisces and Black Moon Lilith is in Sagittarius. Venus and Lilith are a little calmer than last week, where they squared up to each other (Virgo vs Sagittarius, respectively)- Venus now being in Libra. The new moon is a time for manifesting intentions for the coming cycle. What are you lacking in your life? It is time to attempt to bring it in. Too much work/too much play- we need it all held in our own balance. Note-our balance is different- some need more time on one than another. I mean it’s an individual setting, that we need to balance. It is a time for justice as well as balance. We’re seeing it coming out- social justice and equity causes are out there. Lilith in Sag is giving the sacred feminine an empowerment that has been long awaited, however Uranus is Aries opposes somewhat and even makes the Lilith component more edgy and rebellious- on both sides. Although Libra wants justice, it wants harmony within that- so there is a natural desire to try and find a way to meet somewhere in the middle. Our communications influence, Mercury is in Scorpio though- sharp tongued, bitter and also highly emotional Scorpio. Scorpio is lovely, but not always nice, nice was Libra. Scorpio wants to burn the house down (well more likely flood it) and can talk Lilith into it. I would expect this to all come together as a tricky patch, where we are guided to stand up for what we believe on, our justice, knowing life is not fair, that people sometimes are ****s and should be called out for their actions. This is part of our journey, to take a stand (or a knee) for making this world better- for you and me. There will be curse words, there will be tears and there will be people so literally caught up in Uranus to understand it all. Manifesting change isn’t always about making pretty things and covering yourself in fluff, just as it isn’t always about threats, tanks and bombs. It’s finding the balance of this, to make the right change possible- FOR ALL. I love you for being you, so stand up for the you that you are.